at long last, i'm posting my coloured tights episode! since i normally wear neutral colours (my favourites are grey, black, and olive green), i find coloured tights tricky to wear. a few months ago, i picked up two pairs from dollarama - bright red and bright bright purple - but i tucked them away and soon forgot all about them. then i saw the anthropologie catelog and realized that the coloured tights trend has not gone away. not only that but they can be oh-so-stylish and fashionably-fun. i hope i can rack up the courage to wear them one day... the colours are too vibrant to be tucked away in my closet. 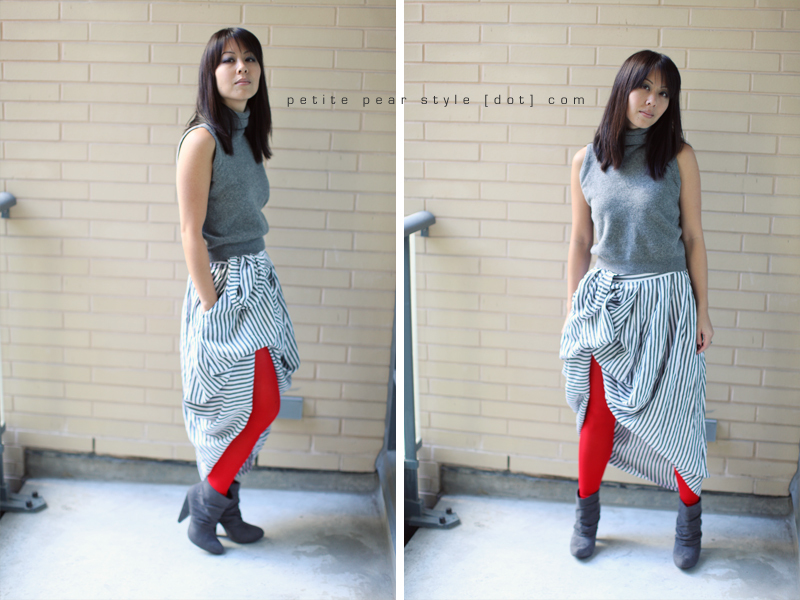 in this video, i experiment with three ways of wearing the coloured tights. i wanted to ease into the trend slowly so i wore a long skirt over the tights and pinned up one side. i initially pinned the skirt up to about knee length on one side. but, as i continued to wear this outfit, i found that i wanted to see more colour. so i tucked the skirt out over the waistband and the skirt was essentially "pinned up" to thigh length on one side. the photos probably do a better job of explaining this! this look is quite loud yet i think it could work at the right event. am i too late for hallowe'en? in all seriousness, i love the boldness of this look but i would probably never wear it. except on my balcony. great, my neighbours know i'm nutters now. okay, how much do these black pumps rock?! i am so glad i picked them up. i actually contemplated not getting them because i was not into chunky heels this past summer. now i luuuuuuurve them. when i was in high school, i used to wear coloured tights with fishnet stockings. i was less of a pear shape then but it was still a great way to tone down the coloured tights and also achieve a slimming effect. i thought i had fishnet stockings at home but i couldn't find them so i tried the look with black pantyhose. the colour of my tights is toned down quite a bit but i'm not sure i look any slimmer. You rock in tights, Lesley. You look very classy and elegant in them.